Born this Way by Lady Gaga played as I entered the Gender Bending Fashion exhibition, on view at the MFA through August 25, 2019. 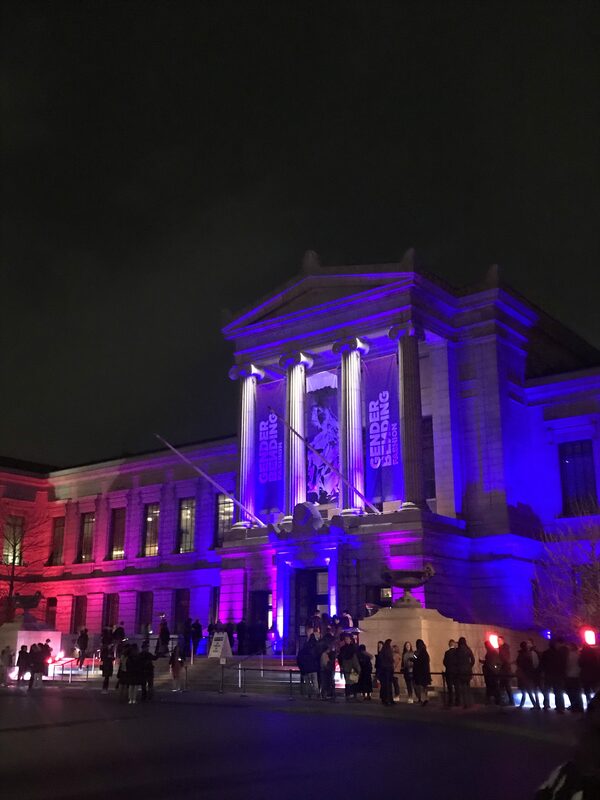 The blacked-out galleries in the contemporary wing were aglow with gradations of blue and pink lighting, splashed with occasional neon orange accents, a seeming stand-in for the complexities of gender expression beyond the binary. 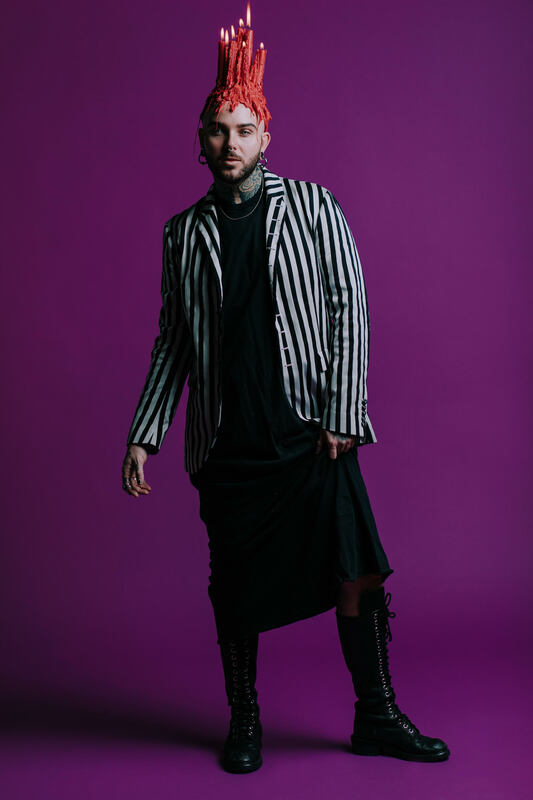 When I first heard the MFA would be hosting an exhibition titled Gender Bending Fashion, I felt my entire body fill with joy, and then, immediately, hesitance and skepticism. Museums have a longstanding history of exclusion, and personally, as a queer person, an Arts Editor, and a curator with an interest in fashion and culture, this topic meant far too much to me to support right out of the gate. 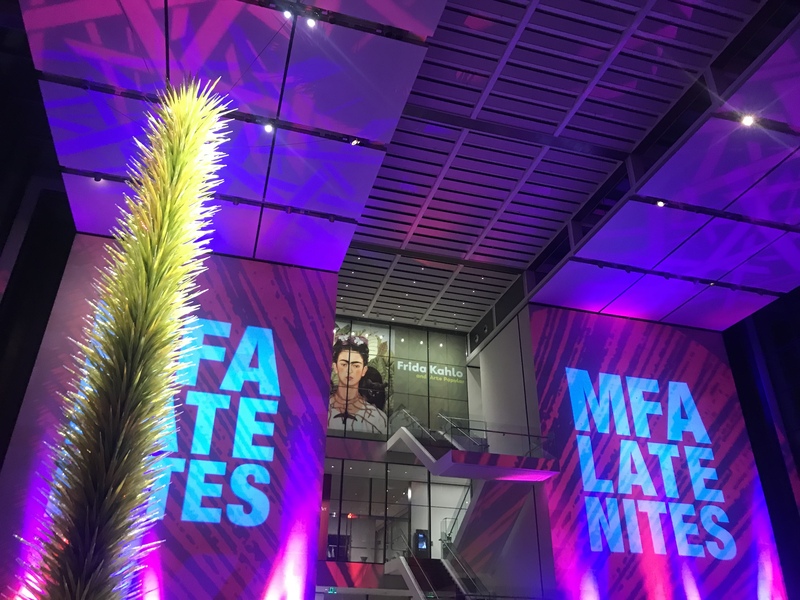 When I attended the exhibition’s sneak-peek opening during the MFA’s Late Nite event Friday March 15th, my concerns dissipated. The MFA clearly defined its definition of “bending,” but also recognized the complexities of such a term: “Gender-bending (adj): that which defies or challenges traditional notions of gender, esp. In terms of dress or behavior.” The problem I have with the word “bending” is that it implies an object with two ends that warps out of (and back into) shape. However, such a metaphor does not translate to gender identity. Because the MFA was clear that gender is a spectrum, but clothing is often assigned a gendered connotation, they were able to expound the idea of gender bending fashion to anything that “challenges, redefines, or obliterates conventions of masculinity.” Instead of furthering the dated idea of “switching” between masculine and feminine dress, Gender Bending Fashion asks us to reexamine our relationship to clothing and identity altogether. 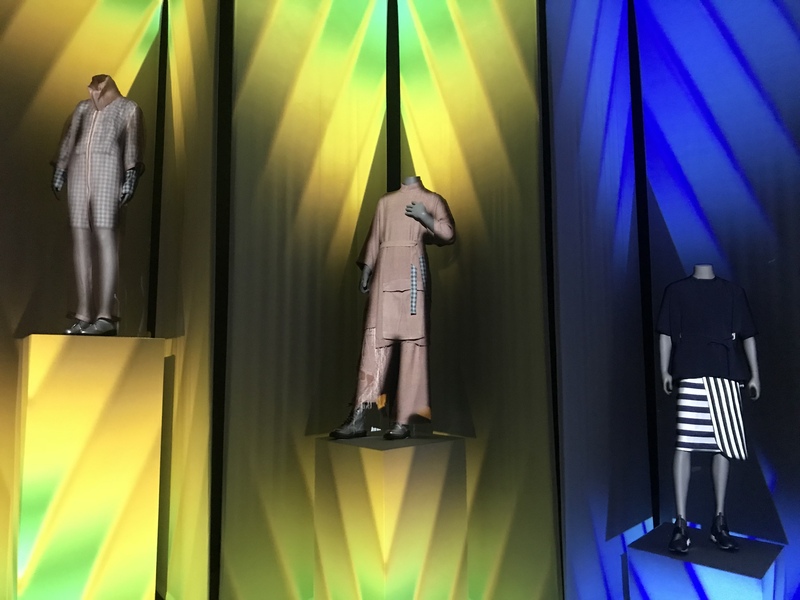 The exhibition itself was framed around three categories of “bending”—Disrupt, Blur, and Transcend—each providing a different framework for understanding the relationship between fashion and identity in society. Disrupt displayed garments in glowing triangular pyramids throughout the room. 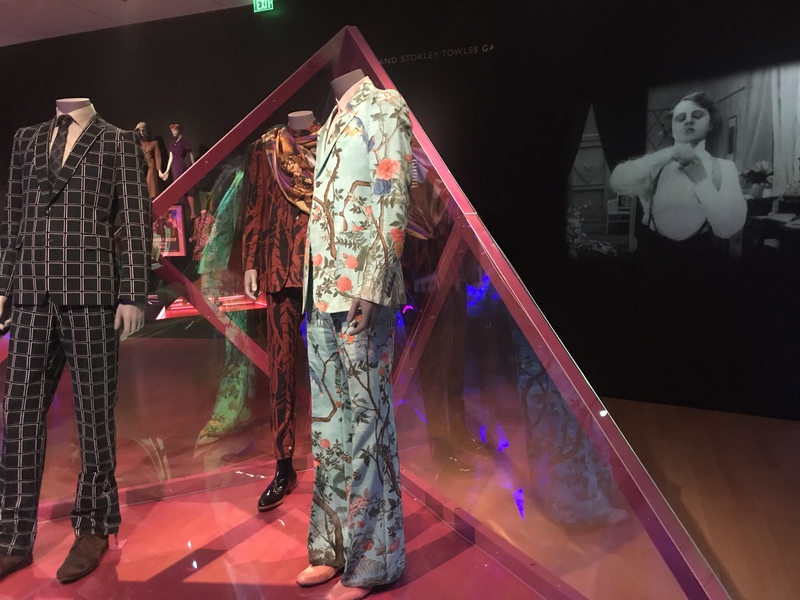 Each geometric frame contained three thematic mannequins, ranging from “Men in Skirts” to “Peacock Revolution,” a trend which brought us boldly patterned suits and countered the expectation “menswear” should only include simple blacks and navys. Each category appeared twice, once with historic pieces and again with contemporary examples. “Women in Suits (Historical),” for example, was framed around conversations about the patriarchal power dynamics associated with menswear. In the later half of the 20th century, women wore traditionally masculine ensembles following “a desire to adopt the corresponding social and political power represented by the male suit.” However, the garments in “Women in Suits (Contemporary)” expanded this narrative, highlighting more artistically experimental works by designers like Comme des Garçons and Bindle & Keep, a queer-owned company. These contrasting case studies in historic and contemporary works reminded that nothing about gendered fashion is static; rather, varying meanings are assigned to clothing at different points in time. Blur outlined moments in history when traditionally gendered clothing roles were blurred due to changing societal conditions. Here, a range of items and documents show the stories of these cultural shifts. 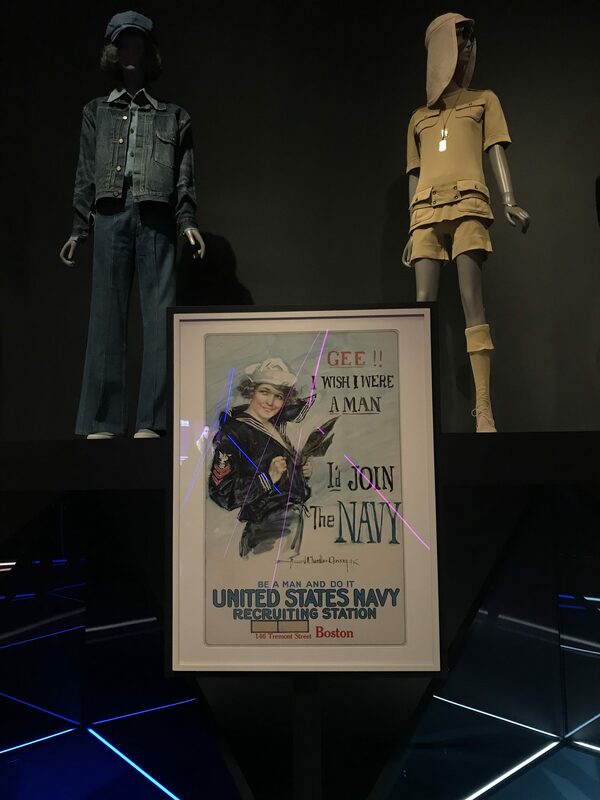 During WW2, women wore typically masculine uniforms as they filled in as factory workers for men fighting overseas; in the exhibition this is represented by the influential posters and advertisements that prompted women to take over these jobs. In the 19th century when biking provided women with new means of transportation and freedom, clothing adapted beyond skirts to include pants to conceal a woman’s body as she rode. The exhibit shows a full picture of what these women were wearing, beyond practicality: a stiff, pinched corset is shown alongside the cycling pants that aided womens’ mobility. If the rest of the exhibition told the story of where we’ve been, Transcend gave us a glimpse of where we might be going. This section contained the work of four contemporary designers who “argue for a future in which clothing will be designed for, and worn by, anybody.” In a time when our perception of gender itself is changing, our understanding of fashion is evolving, as well. Two Point Two Studio, one of the four showcased, opens their designers’ statement with “Agender is the new gender.” Their gender non-conforming work merges elements deemed masculine or feminine until they are unintelligible, creating new silhouettes that undermine the importance of the body altogether. Each work in the section was backlit by projections, shifting from bold gradations of color to video footage from fashion shows. Visually and conceptually, the Transcend section of the exhibition was the most impressive and forward-thinking. While the museum explains the lack of diversity throughout the exhibition by pointing to the historic erasure of marginalized groups from museum collections, it’s also worth noting this gallery of contemporary work was the only one housing several works by designers of color. In the nearby Krupp Gallery, the MFA created a space where visitors could share their own thoughts on gender bending fashion, centered around prompts like “Why do you wear what you wear?” and “How does gender influence your choices?” This open forum reminded that countless outlooks on gender and fashion exist simultaneously in Boston alone. The Krupp Gallery also included a lookbook featuring the personal styles of 10 Bostonians, which was arguably the most relevant and current aspect of the exhibition. The portraits, taken by queer photographer Ally Schmaling, who uses she and they pronouns, highlight the diversity of styles each of these individuals possesses. The portraits are accompanied by mini-interviews where the 10 expound on how identity and experience inform personal style. Schmaling spoke on their contribution: “I felt adamant about the inclusion of one photo for each subject using a shutter drag technique – rendering each subject in one frame simultaneously crystalline and in technicolor motion – speaking to the fluidity and ever-evolving quality of gender and presentation.” This project offered something essential to the exhibition: inclusion and representation, and the feeling that this exhibition was, in part, by and for the queers of Boston. 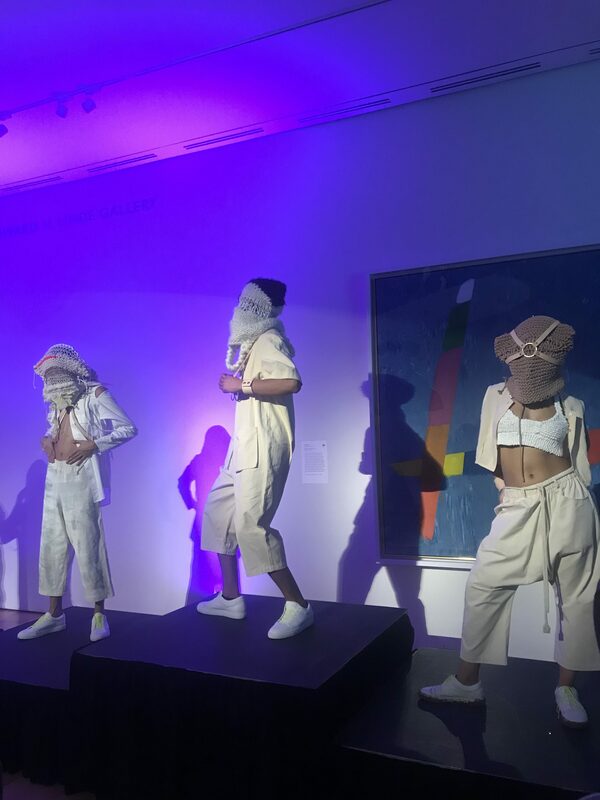 The atmosphere of the Late Nite event itself added a layer of experience to the artworks on display, connecting the topic of gender bending fashion back to our own communities here in Boston. The Late Nite had more programming back to back than one person could even keep up with; a fashion show entitled “Ungendering Fashion” presented by DapperQ featuring the work of four designers: A/C SPACE, Stuzo Clothing, SALT, and LANDEROS NEW YORK; a queer, trans, and gender non-conforming makers’ market; a hip hop performance by Billy Dean Thomas; 10 dj’s throughout the night; and a drag performance by Neon Calypso. The event seemed to bring out every queer person you’ve ever met, their ten closest friends, and their last three exes. The night was full of support and love, people rejoicing, catching up and making connections—the Late Nite exemplified the most perfect feeling of queer togetherness despite all odds in such a traditional setting. I think a quote by Ally Schmaling perfectly sums up the sentiment I’ve heard expressed throughout the past several weeks: “Ultimately, my allegiances are to my community, not to any kind of institution.” However, I am also someone who believes in museums’ capability to do better. I think this is the perfect example of a museum that is doing better: calling in the right people, striving to represent marginalized communities, and providing a welcoming and inclusive environment. I am proud to say this exhibition took place here, in the city I love surrounded by the friends that make Boston so great. I felt the exact same way about this exhibit. I was initially skeptical about how such a mainstream institution like the MFA could showcase this topic with thoughtfulness and sensitivity, but they more than pulled it off. The glossary at the front that explained all the relevant terms took my breath away. The definition of queer was something like, queering something contests the heteronormative. It was great.